Petco has introduced a new collection of pet accessories and toys for dogs and cats called the Dr. Seuss Pet Fans Collection. The collection was created in partnership with Dr. Seuss Enterprises. It is based on the book, What Pet Should I Get?. 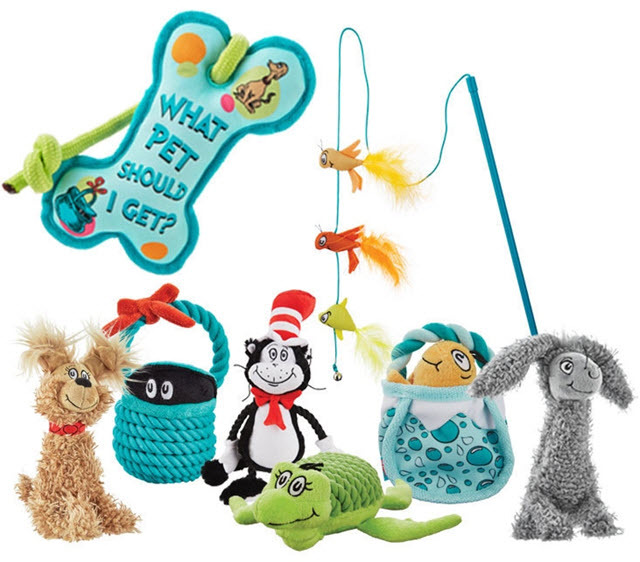 Rebecca Frechette, Senior Vice President, Merchandising for Petco, says in the announcement, "We're pleased to bring more of Dr. Seuss' animated world to life with the introduction of these new pet accessories and toys. The joyful characters are the perfect playtime companions for furry friends and we are thrilled to have Dr. Seuss' latest masterpiece to draw inspiration from!" Prices for the products range from $5 to $10. The Dr. Seuss Cat in the Hat Teaser Toy is pictured below. The collection can be found here on Petco.com.